I was at the cinema at the weekend, in fact it was York City Screen, a truly wonderful venue. 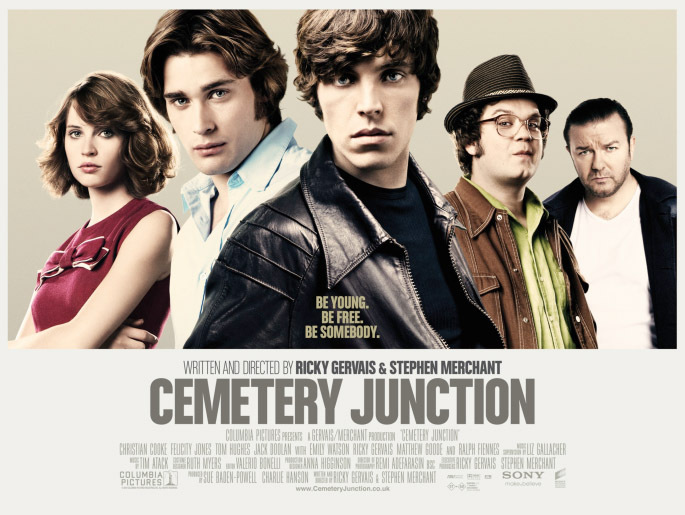 I popped out with Catwoman to see the new Ricky Gervais and Stephen Merchant movie ‘Cemetery Junction’ It’s essentially about three young guys growing up in Reading in the early 70s in a real dead-end part of Reading (Cemetery Junction! …….. geddit?). It resonates quite well with me because I entered my teens around the time the film was set; 1973. In my opinion it was a good film, but not a great film. I would watch it when it is shown on TV but I doubt that I’d buy the DVD. The acting is pretty good though, especially the three lead characters and Ricky Gervais also makes a cameo appearance as the father of one of them. The funniest line for me was when one of the lads says to his parents that he is going to Paris and his Mum responds with this “Paris? There’s parts of Reading you haven’t seen yet!” Classic! I did really love the soundtrack though. Click here to see what Ricky Gervais had to say about the film and the soundtrack in a recent interview in the Guardian. And to finish here are a couple of songs from the soundtrack. Hi, that quote is actually a real quote from Gervais. He says it in one of the podcasts and obviously thought it would work well in the film. I enjoyed it quite a bit, but I am a massive Ricky Gervais fan anyway. I think him and Merchant will make something a lot better next time now they’ve got to grips with film. Excellent debut.